Done for a how to draw book many years ago. A friend of mine form Iran asked me to post this link to an image he drew of Xiphactinus vs Cretoxyrhina. Pretty cool Amin Khalegh! Colors by Scarypet! Fantastic job Brett! From which book is this pic? I thought it was in Thunder Lizards! But maybe it didn't get used? I'll have to find my copy and check it out. Nice Dimetrodon! such an iconic and unusual beast. Poop! 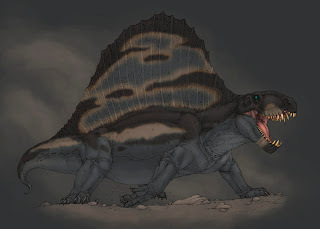 I know that one made it into Thunder Lizards since it isn't really a dino. I think it was saved for the sequel though I don't remember having a colored version. I have enough dinosaurs for a second volume, I just need to quit drawing and start writing more. Somehow a screen full of words isn't as rewarding as a cool drawing. Umm..I thought I typed had not made it into.. So for clarification it ain't in the book and I type like crap.